receive updates on our latest scoops, insight and analysis on the business of flying. It's 2023 and Singapore Airlines 242 is getting ready to fly home from Sydney. July 2023. Kingsford Smith International Airport. Sydney, Australia. Singapore Airlines Flight 242 is on its way back home. The mid-afternoon departure rolls slowly to runway 16L. SQ242 usually uses the much-longer 16R, but a last minute change reassigned the lightly-loaded Boeing 777-9 to the shorter of Sydney’s two north-south runways for the seven-hour flight to Changi International. The jet’s 11 and a half foot tall (3.5m) folding wing tips are still pointed straight up to the sky as it turns onto taxiway B10. The paths to runway 16L in Sydney are a mashup of tight taxiways and part of a global search by Boeing to find airports where the 777X’s transforming geometry might get hung up. The centerline of B10 is 262 feet (80 meters) from parallel taxiway L, that’s just enough for the 777X to squeeze through on its way to the runway. This is precisely a spot for which Boeing designed the 777X’s folding wing tip. The International Civil Aviation Organization gives this tight spot on the edge of Botany Bay a Code E taxiway classification. 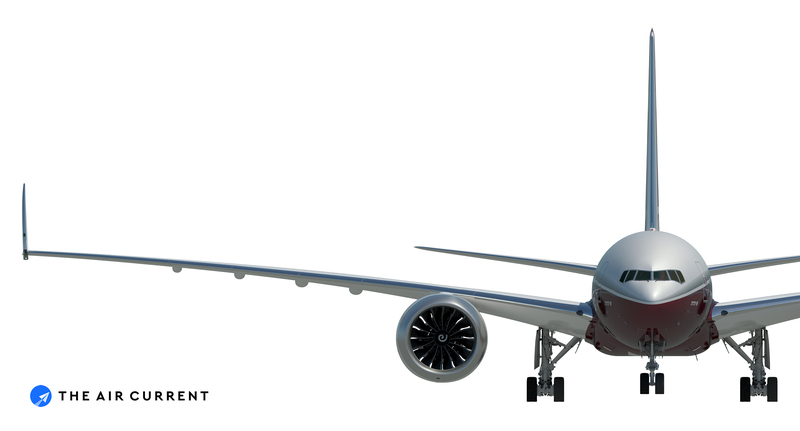 Just enough space for two Code E aircraft with wingspans up to 213 feet (A350 and 777) to pass one another safely. Before it left Gate 53, the crew of Singapore 242 determined during the departure briefing it would be here where the wing tips would be unfolded, ensuring they’d be down and locked before crossing the hold line on to the runway. Jon Ostrower is Editor-in-chief of The Air Current. Prior to launching TAC in June 2018, Ostrower served as Aviation Editor for CNN Worldwide, guiding the network's global coverage of the business and operations of flying. Ostrower joined CNN in 2016 following four and half years at the Wall Street Journal. Based first in Chicago and then in Washington, D.C. he covered Boeing, aviation safety and the business of global aerospace. Before that, Ostrower was editor of the award-winning FlightBlogger for Flightglobal and Flight International Magazine covering the development of the Boeing 787 Dreamliner and other new aircraft programs from 2007 to 2012. Ostrower, a Boston native, graduated from The George Washington University's School of Media and Public Affairs with a bachelor's degree in Political Communication. He is based in Seattle. What is the Boeing 737 Max Maneuvering Characteristics Augmentation System?